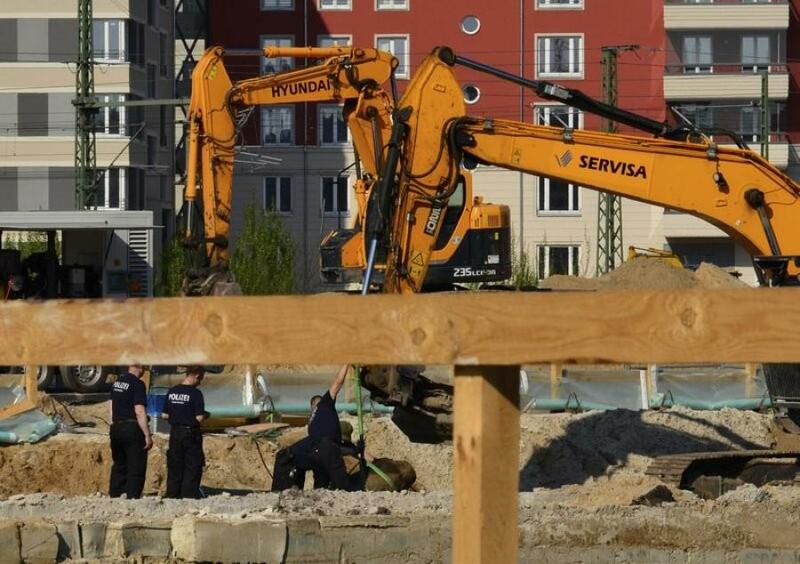 Berlin police evacuated thousands of people from a central area of the German capital April 20 and shut down the main train station as a precaution while they defused and removed an unexploded World War II bomb found during recent construction work. Some 10,000 residents and workers were forced to leave a two-square-kilometer (almost a square mile) area, including the train station, while bomb experts defused the 1,100-lb. British bomb dropped during the war. Trains were prevented from stopping at the busy station from 10 a.m., and through traffic was shut down at 11:30 a.m. before experts began their work, German rail operator Deutsche Bahn said. Some 300,000 travelers use the station daily. Bomb disposal experts were able to successfully remove the detonator just after 1 p.m. and destroy it in a small controlled explosion. The evacuation area, a circle around the construction site north of the train station where the bomb was discovered during digging, also included a hospital, the new offices of Germany's foreign intelligence service, and parts of both the economy and transportation ministries. Even 73 years after the end of the war, such discoveries remain common in major German cities. Downtown Berlin was largely reduced to rubble in hundreds of Allied bombing raids during the war and street-to-street fighting between the Nazi and Soviet armies in the final days of the conflict. Experts estimate that more than 5 percent of the bombs dropped on Berlin failed to explode due to a variety of reasons, including faulty fuses, poor assembly and bad angle of impact. The city estimates at least 3,000 bombs, grenades and other munitions are still buried. They're found frequently enough that they're treated more as a nuisance than a major public safety issue, and authorities are well trained and experienced with their removal and destruction. In one of the more sensational finds, a 550-lb. British bomb was found in 2002 beneath the lower ring of seats during renovation work at Berlin's Olympic Stadium, where tens of thousands of fans regularly watch the city's Hertha BSC soccer club play its home games. Such finds are also common elsewhere in Europe, and Slovak authorities on Friday had to evacuate people in a town near the southern border with Hungary after four unexploded World War II bombs were found by a man walking his dog. Police said the 220-lb. Soviet bombs were found in a field in the town of Sturovo.